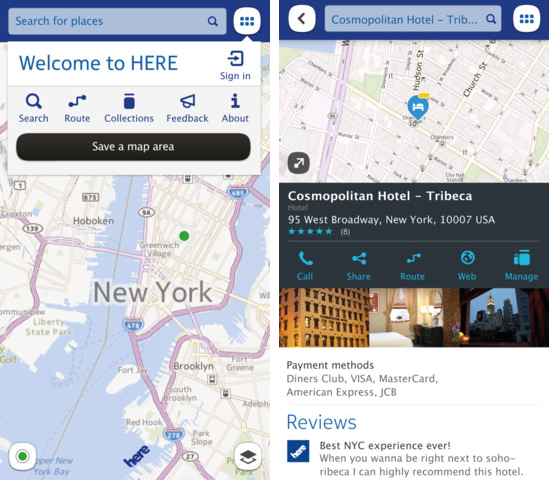 Famous Nokia Here Maps application now available for Android and iOS devises. Nokia on tuesday released Here map application for iOS devices. If you're using iOS 4.3 or higher devices you can use Nokia Here maps into your iPhone's and iPad. Nokia Here maps app comes with useful features like See where you are, search and discover nearby places, and get a feel for the place. You can search places above 200 countries using Nokia Here application. You can collect places to remember or for later discovery and explore new destinations and know instantly how to get there on foot, by car or on public transport using Nokia Here application. And also can share places through SMS, email, or social networks friends. Nokia Here application officially available from app store here, but official version not available in Google Play store. So Android users have to download Nokia Here maps application from Amazon store.